Apple has released iOS 12.1.3 as a new software update for all the compatible iPhone and iPad models. Similar to the previous iOS 12 update, the latest software version doesn’t bring any noticeable changes on board. It, however, addresses some minor bugs to enhance the user experience. 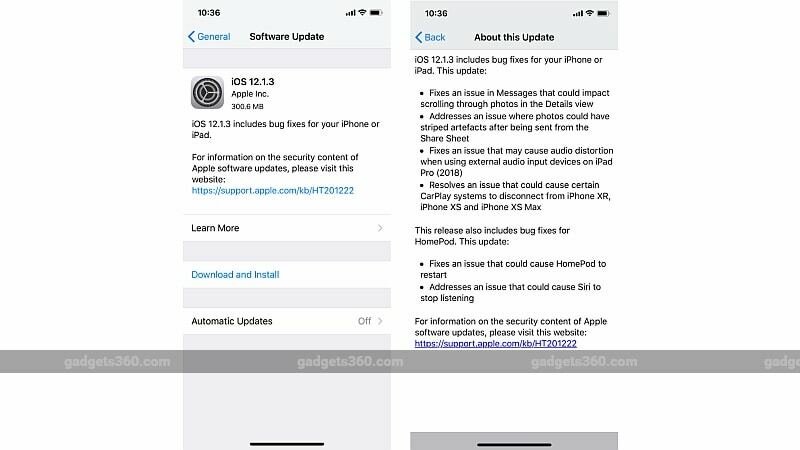 The iOS 12.1.3 update also fixes some known vulnerabilities. 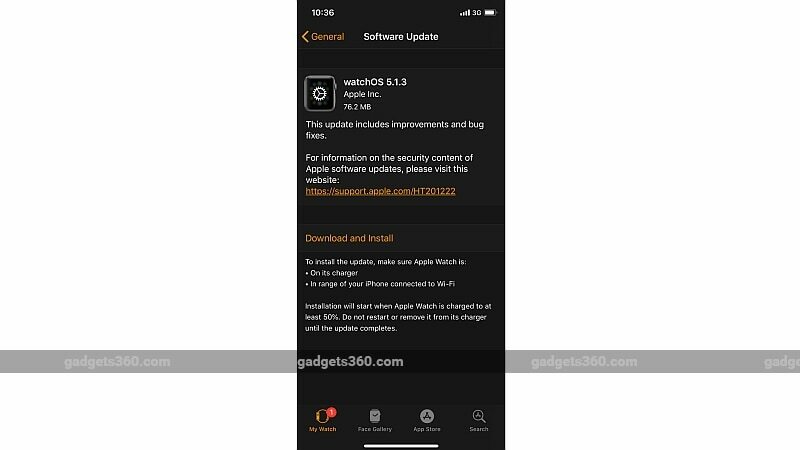 The Cupertino giant has also brought watchOS 5.1.3 with bug fixes. Apple’s HomePod has also received a couple of improvements to address the existing issues. As per the official changelog, the iOS 12.1.3 update fixes a bug that was impacting scrolling through photos in the Messages Details view. The new iOS version also addresses the problem that was bringing striped artefacts to photos after being share from the Share Sheet. There is also a fix for the issue that was causing “certain CarPlay systems” to disconnect from the new iPhone models, including the iPhone XR ₹ 75,400, iPhone XS ₹ 92,433, and iPhone XS Max. Specifically for the iPad Pro (2018) models, the iOS 12.1.3 update fixes an issue that was causing audio distortion with some external audio input devices. The latest iOS release also has some fixes pertaining to the HomePod. It essentially addresses a random restart issue and fixes a bug that was causing Siri to stop listening to your commands. Notably, Apple hasn’t detailed in the official changelog whether the iOS 12.1.3 update fixes the cellular data connectivity issues that were reported for the iOS 12.1.2 update last month. Aside from the latest iOS update, Apple has released watchOS 5.1.3 for Apple Watch Series 1 and above models. The update carries unspecified improvements and bug fixes, as noted in the official changelog. You can read about the security content of iOS 12.1.3 by visiting the official support page. Apple has also detailed the security content of watchOS 5.1.3 on its support page. The iOS 12.1.3 update is compatible with all the iPhone and iPad models running iOS 12. To download the latest version on your device, go to Settings > General > Software Update and then follow the on-screen instructions. Your device should be using a Wi-Fi connection to download the over-the-air update. Also, it is recommended to back up your data, and ensuring your device has over 50 percent of charge or connected to a power source before beginning the update process. The watchOS 5.1.3 update is compatible with all Apple Watch models running watchOS 5. To download the update, go to the Apple Watch app on your iOS device and then visit General > Software Update. The Apple Watch needs to have at least 50 percent of the battery charge to enable the installation process. Also, it is recommended to keep it on the charging dock while installing the new update. Your iPhone will also need to be in close proximity to the Apple Watch and will need to be on Wi-Fi. The Apple Watch should restart twice before the update is completely installed, and you need to enter the Watch passcode if prompted, after beginning the update and then follow the prompts from your iPhone. Can IoT networking drive adoption of IPv6?